Welcome to Foodie Call’s annual (hopefully) list of the best meals. 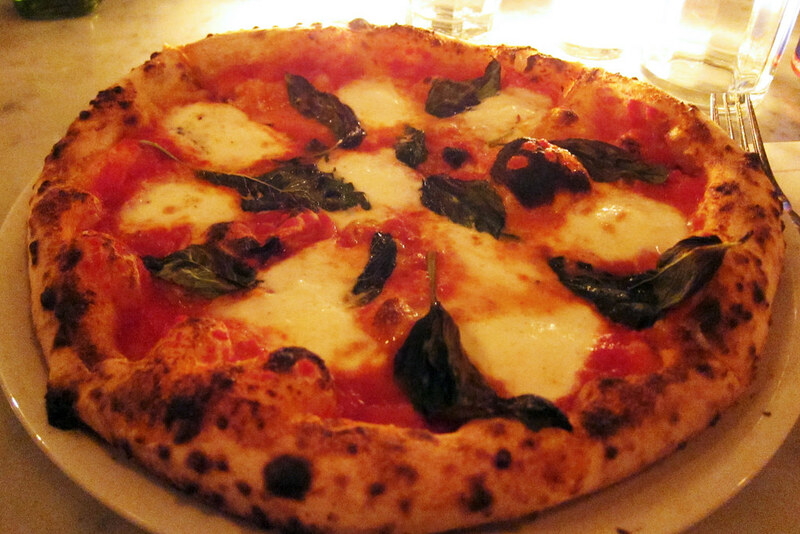 Gary runs down the best meals he had in 2010 – in New York City and beyond. Also, some honorable mentions and additional thoughts on the year in food. The 10 Best Meals. Who Are They? Who’s Number 1? I am one lucky sonofabitch – I live in one of the best cities in the world for food, New York City, but I also found the time to travel to some other cities with great food, including San Francisco, Seattle, and Boston. Whittling down all the meals I’ve had to just a list of the 10 best wasn’t easy but it had to be done (so I thought anyway). 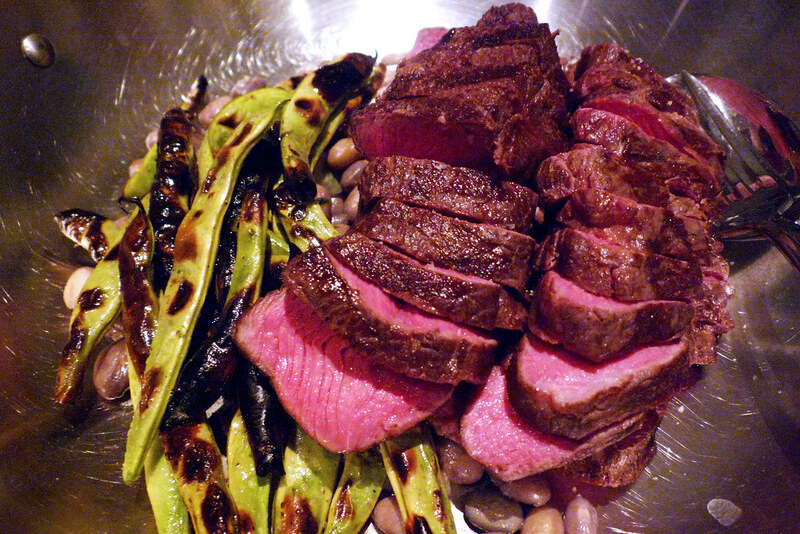 Without further ado, here is my list of the 10 best meals I enjoyed in 2010. Note: The only meals on this list are those that I reviewed in full on this site in the past 11 months. So in case you’re wondering why Minetta Tavern (January) or Momofuku Bo Ssäm (no full review) didn’t make the list… well, now you know why. This Brookline, MA sandwich shop continues a trend I’ve enjoyed seeing grow over the past few years – better, higher quality sandwiches that will slowly move us all away from the mostly boring sandwich chains that have multiplied without abandon in the last decade or so. Their regular sandwiches that I’ve seen look like they’d be tasty but I’m all about the Saturday roast pork specials. The pork fennel sandwich I ate on my visit was just a tremendously awesome sandwich – nice pork and nice toppings, all within a hearty roll. This Yountville, CA (Napa) restaurant from Thomas Keller serves up excellent French bistro food. 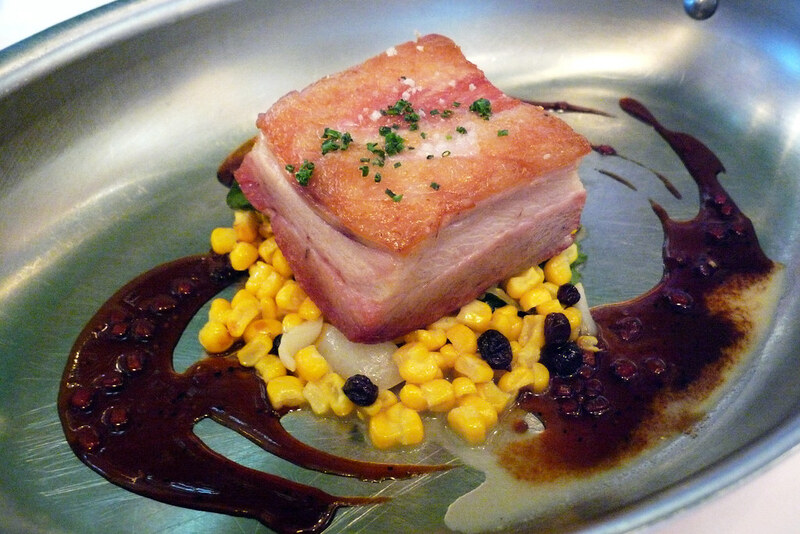 My pork belly, while not setting the world on fire, was still excellent and expertly cooked. That may be the best way to describe the place – expertly, well executed cooking. That, combined with the excellent appetizers, Jeremy’s roast chicken, and great service, makes this a great meal and experience. Oh, hey, another sandwich place makes the list! Technically, the Seattle, WA storefront is the place to satisfy all your cured meats desires and the sandwiches are just the selected method of delivery. So why, in my one and only visit, did I get a sandwich that didn’t include the cured meats? 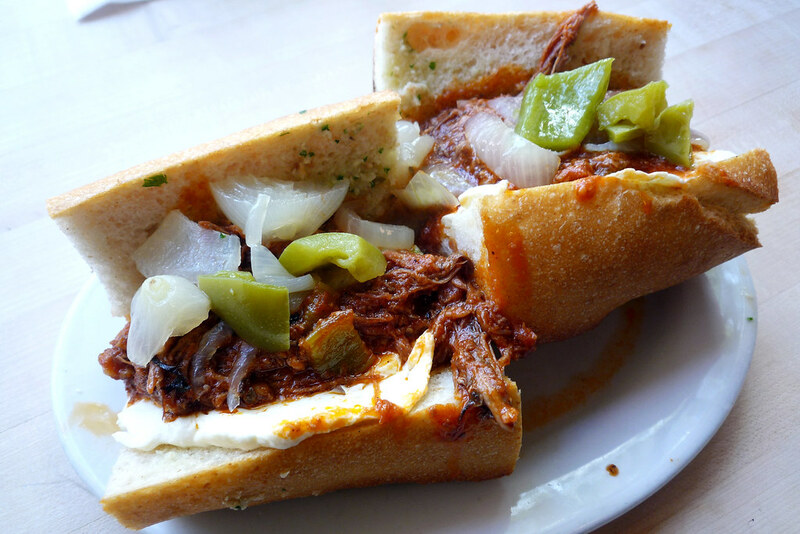 Simple, they had braised oxtails in their sandwich special for that day! Extremely greasy and fatty but so sublime in flavor. Yes, I did get some cured meats just because it would be stupid of me not to but it’s good to know that’s not all they have to hang their hat on. Related Posts: Salumi Artisan Cured Meats. Okay, last sandwich, I swear. Much like its brother on the list, Salumi, the sandwiches are just the preferred way to eat the delicious rotisserie meats their truck hauls out to San Francisco’s Ferry Building every weekend. Did I say haul? 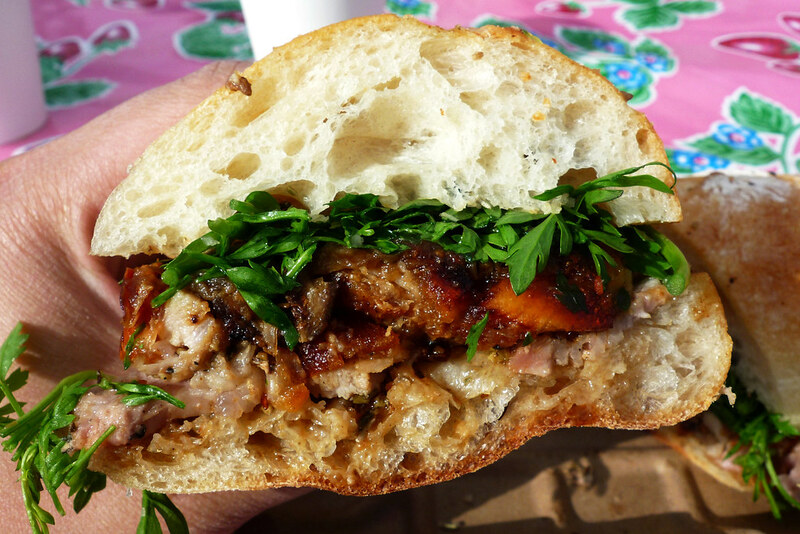 I meant cook – their truck is a mobile rotisserie operation churning out chicken and delicious porktastic porchetta. 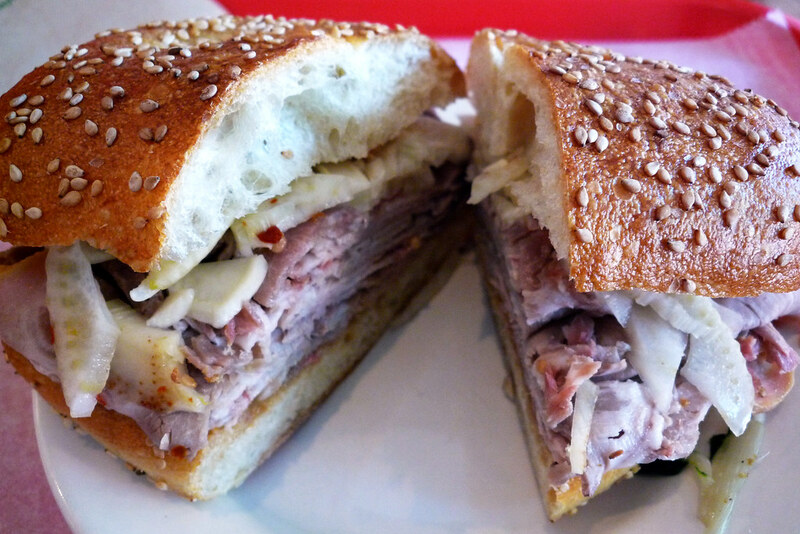 Slap that pork on a ciabatta, a good amount of salt and herbs, and you’ve got one of the best sandwiches I can only dream of finding in New York City. Visiting a new restaurant on their second night of service may not be the best way to review them so it’s possible my thoughts on the place may be wildly different than those that came after my meal. Somehow I doubt that it will have gone in a negative direction because even at an early point in their existence, this Seattle, Wa restaurant was pretty much already firing on all cylinders. Excellent food, good service, and really nice ambiance but I do worry about them being a little out of the way. Here’s hoping they’re still rocking it out. 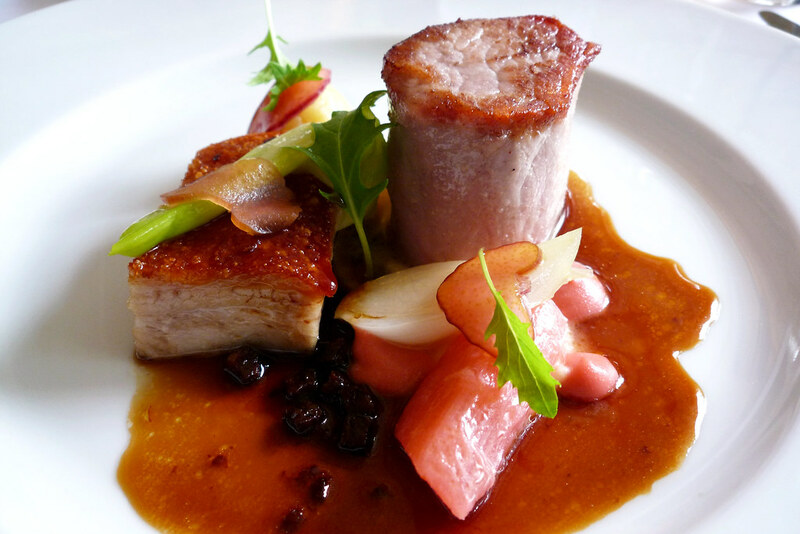 I’m not sure I need to say much about April Bloomfield’s lovely ode to the British gastropub. After all, The New Yorker already devoted over 8,000 words to describing the chef and her growing stable of New York City restaurants. I will say that while the burger is deservedly lauded by many, there’s plenty to keeping one coming here even if it’s not for the burger. Related Posts: The Spotted Pig. I actually had lunch here during Summer Restaurant Week in July. That was a fine meal but it wouldn’t have made it onto my list of the 10 best. But breakfast? Breakfast here, to my astonishment, is ridiculously awesome. 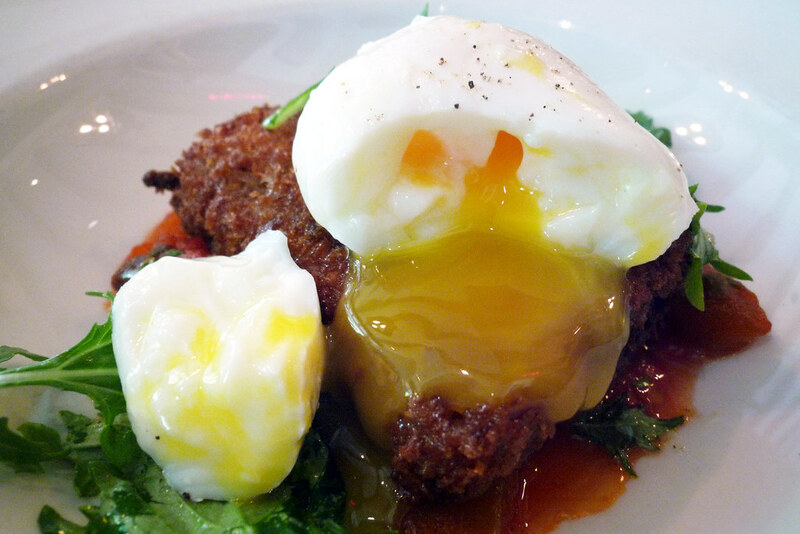 While the pastry, the bacon, and the coffee were all wonderful, it’s the Coppa Croccante, a crispy pork terrine with a poached egg on top, that secures its place on this list. I mean, just look at that egg yolk oozing onto the terrine! Related Posts: Breakfast at Maialino, Maialino. The menu at this Napa restaurant may change from day to day but if the meal my college friends and I had here was any indication, you’ll likely find a high-quality comfort food-like meal in a very nice setting. We went on steak night which, from what we ate, was clearly the right night to visit. And at $49, it’s a very good bang for your buck. Oh, hey, a Danny Meyer restaurant tops the list. What a shocker! Admittedly, it’s tough to write about this meal without acknowledging the wonderful $28, two-course lunch I had is, sadly, no longer offered here. I get that they’re trying to act more like a four-star restaurant but when the food is already there, why the need to change the menu just to seemingly raise the prices to a perceived four-star level? 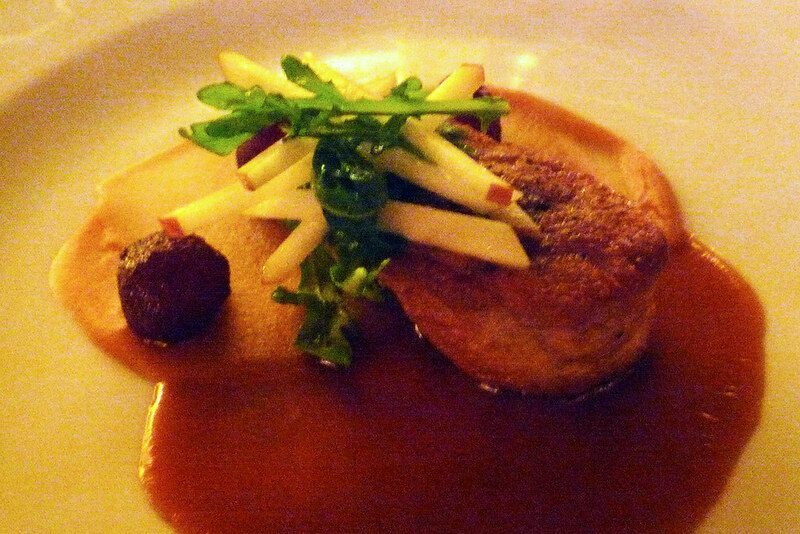 Complaints about the change in direction aside, this was just an amazing meal and an absolute steal for what I paid. Related Posts: Eleven Madison Park. So what didn’t make it onto the list? Plenty. For my friend Jessica’s birthday, a bunch of us had the Bo Ssäm at Momofuku Ssäm. We were happy. Also, we were stuffed. But in a good way! Following up the Bo Ssäm, a bunch of us reconvened at Momofuku Noodle Bar for the Fried Chicken meal. Again, we left happy. Perhaps not as happy as we were after the Bo Ssäm but still plenty satisfied. I had some excellent Hanoi-style phở at Turtle Tower in San Francisco, CA. The doughnuts at Top Pot Doughnuts in Seattle, WA are off the hook. For some really good dim sum in Seattle, I heartily recommend Jade Garden. If you’re a daytime drinker like myself (kidding, sorta) and find yourself in Williamsburg, you could do worse than a sandwich at Saltie. In addition to fried chicken from Momofuku, I thoroughly enjoyed the fried chicken at Charles’ Country Pan Fried Chicken and at Hill Country Chicken. I had a surprisingly good burger at HB Burger. Aside from Ippudo, Totto Ramen may be making the best ramen in the city. The best ramen in Boston, in my opinion, is to be found inside a tiny storefront encased in a supermarket, Ken’s Noodle House. If Mile End is any indication of how great Montreal food can be, I can’t wait to see more of these kinds of places open up in NYC. 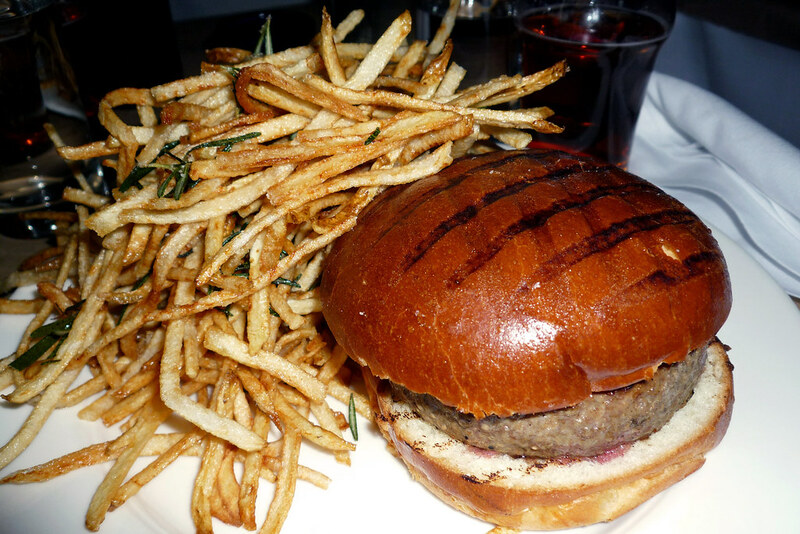 I dined at two other Danny Meyer restaurants this year – The Bar Room at The Modern and Tabla. I went to The Modern during Restaurant Week and I probably wouldn’t go back unless under the same circumstances since it’s a little pricey. Sadly, I’ll never be dining at Tabla again because it’s now closed for good. Some additional thoughts on food and eating in 2010. This year, perhaps more than any other in recent memory, saw me getting a lot of my meals from food carts, trucks, and stalls. I had a good time eating through the selection at the Red Hook Ball Fields [Parts 1 and 2], the international flair of Los Angeles-based Kogi’s collaboration with ESPN for the World Cup [ESPN Match Truck], the vendors that showed up at Brooklyn Flea, the wonderful Greek offerings from Souvlaki GR, and the comforting familiarity of Taiwanese food cart A-Pou’s Taste. Events – I’ve been to a ton since this blog started in February and I’m fortunate to have been able to attend every single one. Some, though, do stand out among the rest. The Bacon, Chocolate, Cheese and Beer Tasting at Jimmy’s No. 43 was a lot of fun and I came away with the added bonus of meeting Eater NY editor Amanda Kludt, who I would eventually intern for some months later. The Vendy Awards… man, what more can I say about it that I haven’t already said? The two days sampling all the fare at the Grand Tasting during the New York Wine & Food Festival might be the most food I’ve ever ingested in a 24-hour period [Parts 1 and 2]. The McRib Launch Party might be the single most ridiculous event I’ve ever been to though I’ll give McDonald’s credit for pulling out all the stops. The Philly Happy Hour + Dinner at Michael’s New York had some really great cocktails and some good food with plenty of good company – a win on all fronts. I hope you guys like Shake Shack because I wrote some posts about them these past 11 months. And by some, I mean lots. Foodies are nuts. This opinion was borne in on me from seeing the crowds at some of the events I attended. The Grand Tasting during NYWFF were busy but the Vendy Awards was just bananas, with some vendors seeing people wait in line for an hour. And I don’t even need to expound upon the debacle that was the Grub Street Food Festival – a great idea but the execution was lacking making the oft-busy Brooklyn Flea a walk in the park by comparison. Finally, can we quit it with the talk of “trends”? I admit I’m guilty of overusing that word in some of my posts and I know it’s an easy way of describing something when it’s hip but trends do eventually die, right? The problem with all these “trends” is that they’ve popped up, exploded, and showed few signs of abating. Take a look at some recent so-called “trends” that have yet to find the downward slope in their popularity and growth – burgers, food carts and trucks, Neopolitan pizza, fried chicken, cupcakes (okay, maybe that one is dying finally). Can we just stop making everything out to be a trend when it’s simply just really good food and/or business models? Or better yet, let’s just lump all the trends into one – “good food.” Can we just live with that? Now if you’ll excuse me, I’m going to start looking into trends for 2011 so I can be told what I need to be eating next year.